As we both proudly and humbly celebrate Parkinson Awareness Month and the First Anniversary of our Parkinson’s Disease Program, please share these event announcements. As you see in the Flyer below we will have the pleasure of Dr. Machado’s presence and knowledge on April 24th at 1:30 to discuss Dyskinesia. This presentation will be of interest and value to professionals as well as families and we will be most grateful to have your support in informing the community. 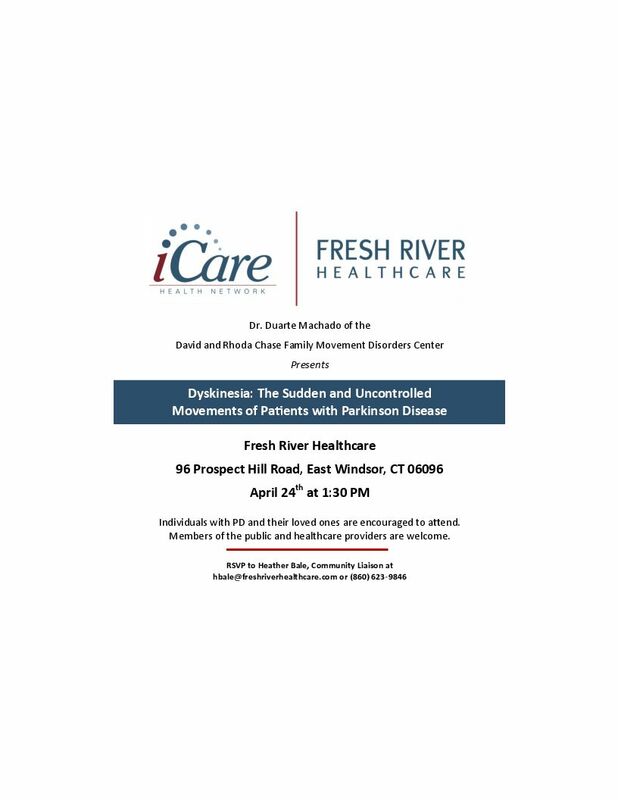 RSVP’s to both are appreciated at either hbale@freshriverhealthcare.com or 860-623-9846. Join us for Pick a Pasta Night on April 25th from 5-8pm! It is to benefit two great causes, the Veteran’s Base Camp and the First Responders. It will be held here at Maneeley’s! Adults are $15 and children are $10. Family friendly walk and fundraiser with large raffle, DJ, face painting and free lunch. Free t-shirt with every registration. Bring a bag of nonperishable food items to support the Power Pack program sponsored by East Windsor Hunger Action Team and receive 5 free raffle tickets (limit 5 per family). Registration and check-in starts at 8:30. Free to Customers and the General Public. **There is a two box/bag limit per person; staples do not have to be removed but all documents must be taken out of folders and binders. For further information, please email mwalker@windsorfederal.com. Saturday afternoon at the movies! Come join us in the Community Room at 1 p.m. Mary Poppins Returns, rated PG, a movie the entire family will enjoy. Children 11 and under must be accompanied by an adult through the entire movie. There is no registration or fee and popcorn will be served. On Sunday, April 28, Agonist Gallery will host our Early Spring Artists Market. All area visual artists are invited to bring 1-3 pieces for display in the gallery for the day- 11 am to 4 pm. There are no commissions on sales, and the price to exhibit is only $10 at the door. There will be no charge for our visitors, and there is ample parking. Bring some new work to share and test out. Our Artists Markets are a place for artists’ to show new work without great expense or time commitment. Accepted work includes photography, painting, illustration, drawing, ceramics, and sculpture. Work will be hung on display panels normally used for outdoor art fairs. If You have Any Questions please feel free to contact Jeff/ Hope to See You There!